Just a quick note to let you all know that the new Google Ads interface is 100% live and the old AdWords interface is no longer available. Although many of you are already using this new interface, we are still coming across a number of people that haven’t even seen the changes and are completely unaware of how this will affect their campaigns. As explained in What’s the ‘Score’? 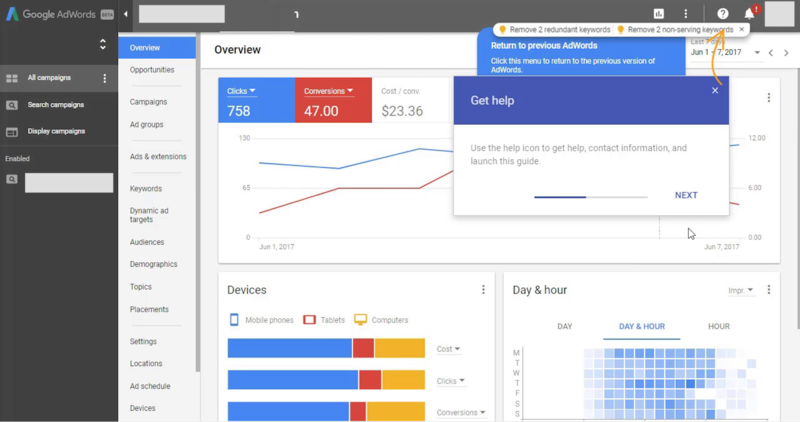 The new AdWords Interface! there are several new features which will benefit your business. It’s worth spending time to get to grips with how they can help you and your business progress. Shortcuts – There are more keyboard shortcuts. This will create a more streamlined experience if you familiarise yourself with them. Showcase shopping – a new type of campaign. Without going into much detail, this is an an all-encompassing, expanded shopping advert format that will appear for more general product searches, e.g. ‘swimwear’. Therefore, it is only really applicable to high-volume products, not the more niche markets amongst us. Search Promotion extensions– in our opinion, one of the most useful functions to come out of this update. This allows the user to expand their adverts without consuming expanded advert text characters. It also enables you to set promo codes, countdown features and more. These are just a few examples of what has changed – if you want to find out more, get in touch and talk with one of our analysts who will talk you through the new interface and give you a free strategy consultation today.